Established in November of 1999. Nestled in the foothills of Colorado's Rocky Mountains is Sweet Cheeks Soap Company, a home-base and body care business that celebrates the beauty and wonder of nature. Sweet Cheeks products are animal and environmental friendly, petroleum and paraben free. 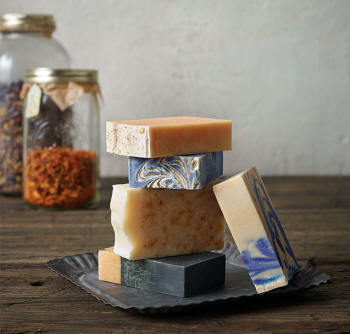 All soaps are made with olive oil, coconut oil, cocoa butter and fair-trade unrefined shea butter. Using pure & natural essentials oils and fragrance oils, as well as taking advantage of herbs, botanicals, spices, clays, tea blends, beer, wine and extracts guarantees a luxurious & guilt free indulgence. At Sweet Cheeks, our work is a labor of love. Long hours have gone into the testing and development of our products and we are happy to share the fruits of that labor with family, friends, and our customers. If you are interested soapmaking, bath & body product, live in the metro area click on classes for more information. Please direct any comments or questions to Laurie@sweetcheeksco@com. Sweet Cheeks Soap Co. was featured in the February issue of 5280 Magazine. To read article click here​ and scroll down to the fifth artisan.